I was inspired for this dish by Yula, thank her a lot, though there left almost nothing from recipe- in fact, it is — terrine, and beer, what do we need else? Marinate for a night chopped meat in beer and spices, I put quiet a lot of thyme (springs), because I like it, few bay leafs and salt-pepper. Separate meat in the morning (I think, it will be difficult to confuse turkey and pork), and chop half of each type, and chop other part almost in mince, add leaves of thyme. 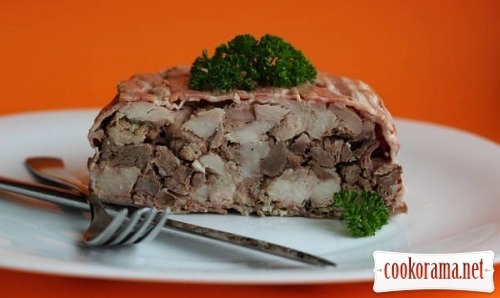 I was lazy with small ones and as a result my terrine during cut fell apart, do not repeat my mistake. Mix pieces of turkey with turkey mince, pork mince – with pieces of pork. Spread ceramic /glass/ clay baking form with strips of bacon – bottom and side walls. And spread there layers of meat, I for example put half of turkey down, then all the pork, turkey on top. Top with bacon. I put on bacon bay leaves from marinade and few springs of fresh thyme. Pour some strained marinade, which left, cover with lid and bake for 2,5 hours at 150℃. Take out, let it cool, better for a day, or night. This is fantastically delicious, believe me! Beer is not felt at all, meat gerts such an interesting taste, that it is impossible to say «from whom»; this terrine is, but very tasty. Strongly advise. You can cook from anything-any meat, actually — chicken, duck, turkey, rabbit, pork – in any combinations. 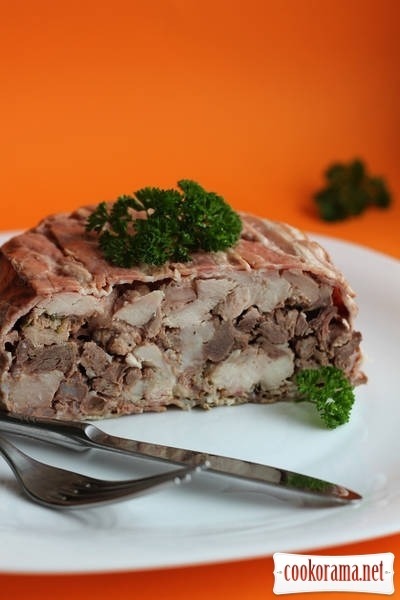 Top of recipe "Terrine in beer"
Рецепт трохи заморочливий, але не сумніваюсь, що смачно. Але мені, для повного задоволення, не вистачає покрокових фото. Заморочливий? Замаринувати м«ясо, порізати його і викласти у форму? Не розумію твого подиву, для мене готувати страву дві доби — заморочливо, хоча, якщо так необхідно, я берусь до справи. якщо під «готувати» розуміти сам процес, то нема нічого заморочливого. дійсно тільки «порізати його і викласти у форму». на шашлик теж потрібно м’ясо маринувати, чи торт в холодильнику ніч постояти повинен — ми ж не говримо, що готували цей шашлик/торт 1,5 дні.